Unfortunate hikers know this plant’s aggravating sting. Brushing up against it with your skin causes an unforgettable stinging sensation. Small sharp hairs along the stem and leaves are to blame. But don’t let the name scare you away. This plant is a nutrition bomb with a unique, slightly woody flavor. Simple rubber gloves will protect your wrists and hands while harvesting, and once cooked, those stinging hairs disappear and lose all their power. And here’s a little-known tip on harvesting with your bare hands. 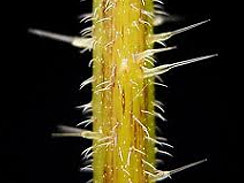 The hairs only sting when you “brush” against them. If you firmly grasp the plant with pressure, the hairs are crushed down flat and can’t hurt you. Take a deep breath, trust me, and try for yourself. Stinging nettle grow abundantly in fields and empty lots in Spring. They love seasonally damp areas, especially 10-20 feet from rain channels. They grow about 1-2 feet high, usually reaching midway up your calves. I haven’t noticed them at altitudes above 500 feet. Keep your eye out for Giant Nettles too. They’re a super-sized version of stinging nettles, growing to about 6 feet tall with leaves the size of your palm. 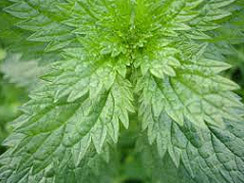 Because of the leaves’ size, they’re less tedious to clean and process for cooking than the smaller stinging nettle’s leaves. Giant nettles generally grow in shaded forest areas, especially near water. Look for them alongside sheltered brooks. While wearing rubber gloves, wash stinging nettle plants. Remove any thick woody stems, thin pliable stems can remain. Set aside. Dice all vegis, the smaller the better. Saute all of the vegetables individually in olive oil, allowing carrots, celery, potato and onions to brown for savory flavor. Add to stock pot, cover with water, bring to boil then reduce to simmer. Add rosemary and thyme sprigs. Stuff as many stinging nettle leaves as possible into the stock pot. Cook at least 15 minutes, until all ingredients are soft. Remove from heat and allow to cool for at least 1/2 hour, stirring occasionally to speed cooling. Transfer in batches to blender, and puree. Return to stock pot. At this point, taste your soup. If you feel it needs more flavor, add your favorite vegetable stock or a touch of nutritional yeast. Season with salt and pepper to taste, add fennel seeds. Heat over medium flame, insert teabag for approximately 1-2 minutes, allowing flavor to steep. Remove tea bag. Remove from heat to server. Optionally, stir in heavy cream for a thick buttery flavor. While wearing rubber gloves, wash stinging nettle plants. Sterilize a large glass jar and its lid (60oz jar should work well) with boiling water, then set aside. Dice all plant and vegi ingredients, including nettle stems, the smaller the better. 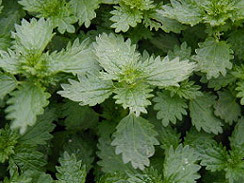 The mass of diced nettles should approximately equal the mass of all other diced items combined. Dissolve brown sugar in 1/8 cup very hot tap water by stirring. Place diced plants and vegis in large bowl, adding liquids and all remaining ingredients. Stir to distribute ingredients evenly. Move 1/2 of mixture and liquids to blender, blending on high speed until moderately smooth, about 20 seconds. Pour back into bowl. Spoon all contents into sterilized glass jar and refrigerate. The taste improves with time as peppers’ sting mellows and flavors blend over 24-hour period. 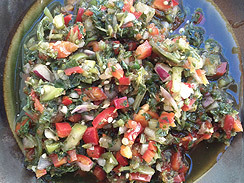 Due to high acidic level, salsa should last at least 2-3 weeks refrigerated.